The Government of Maharashtra set up an independent mission in 2005 with the support of the United Nations Children’s Fund (UNICEF). It is called Rajmata Jijau Mother Child Health and Nutrition Mission (RJMCHN) and is the first nutrition mission in India. The primary objective is to create a platform for strengthening inter-sectoral coordination between government departments and also to bring in expertise through multi-stakeholder involvement. The formation of the Mission was stimulated by a visit of the ‘Citizen’s Alliance against Malnutrition’ established at the national level in 2006-2007 and represented by a group of young and motivated members of the Indian Parliament from different political parties together with media personalities and development practitioners. This high profile team visited the least advanced districts in the country and provided suggestions to the Prime Minister for appropriate action, thus positioning an urgent but invisible issue on the political map. Under the guidance of the Chief Minister of Maharashtra, RJMCHN took the lead in creating a multistakeholder platform (MSP) by bringing in Members of Parliament, business leaders and leading media personalities to form the Maharashtra Alliance against Malnutrition (MAAM). A round table consultation with the participation of young parliamentarians, key business leaders, media personalities, UNICEF, government departments and representatives from non-governmental organisations (NGOs) was held in November 2013. This was the first time that such a diverse group had been assembled to share their views and commitment to working together in the fight against malnutrition. provide effective therapeutic food for children suffering from severe acute malnutrition by implementing globally accepted protocol. A unique experiment involving a tripartite partnership between the government (Public Health Department), private sector (Riddhi Management Services Pvt. Ltd) and the United Nations (UNICEF) is set to change the way health services are delivered and monitored in Katol block, Maharashtra. The partnership, involving 60 health workers, focuses on fifteen high burden districts, and aims to ensure that each mother, new born and child up to five years of age is tracked and provided essential health and nutrition services. After consultation with Auxiliary Nurse Midwifes, Riddhi has designed and introduced a mobile phone technology called ‘Janani’ (meaning mother). Through a combination of internet telephony and a server based computer programme, front-line health workers can record more than 200 data fields by speaking into their mobile phones. The voice data are recorded on a memory card and the system automatically transfers these data to a web server whenever there is internet connectivity (which is sporadic). The Riddhi technical team provided intensive training to health workers and on-field support to ensure smooth implementation. “All innovations are driven from the field. Everything that happened here is because of the demand that emerged from the field and we only implemented solutions based on the demand” KK Pal of Riddhi Management Services Pvt. Ltd. In addition to tracking, the phone is loaded with six videos in Marathi (the local language) on infant feeding, hand washing, use of oral rehydration solution with zinc for diarrhoea management, and importance of routine immunization, breast crawl and ten steps for making hospitals baby friendly. The most commonly used videos are those on breastfeeding and hand washing. Mothers find these videos extremely educative and they are proving crucial in bringing about behavioural changes in the community. During the last year of implementation in Katol block, 1,506 pregnancies have been registered and 511 deliveries have taken place. Of these 209 were identified as high risk pregnancies and 81 low birth weight children were identified. Partnerships between different stakeholder groups to improve nutrition are increasing in Maharastra. The Sion Hospital (one of Mumbai Municipal Corporation’s hospitals) is experimenting with locally manufactured therapeutic foods for treatment of children with severe acute malnutrition from Dharavi (Mumbai’s slums). The hospital has partnered with the Indian Institute of Technology in Mumbai and some non-resident Indians to finance the cost of the micro-nutrient premix: an essential ingredient of therapeutic food. conducted of 180,000 children, about 100 each from 1,980 anganwadis (pre-school nurseries) in August to September 2013. 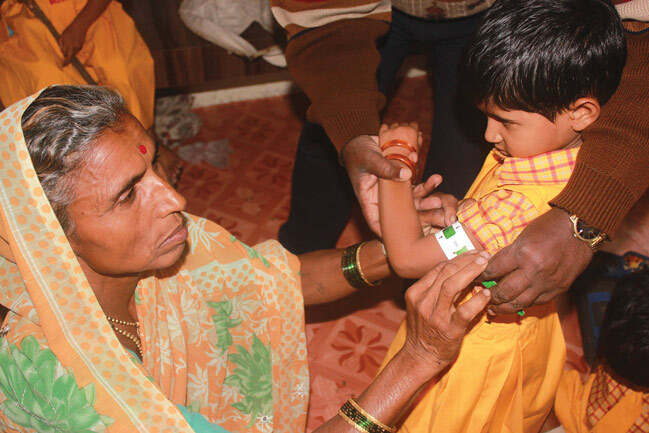 Students from the colleges were mobilised to visit villages and take measurements of the weight, height and mid-upper arm circumference (MUAC) of children in the 0-6 age group. The purpose was to verify and validate government data collected through the Integrated Child Development Services (ICDS)5 on the extent of malnutrition: under-weight, stunting and wasting. RJMCHN will work with academic institutions to analyse the data. The MAAM is an MSP involving actors from across government and external to government. There has recently been a consultation to explore the potential for private sector participation. 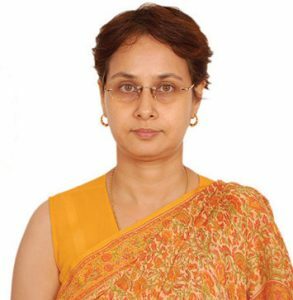 Rajmata Jijau is leading the process of coordinating between government departments and the corporate social responsibility (CSR) wings of businesses. One-to-one talks have been initiated focusing on social development as part of CSR. The Indian Government introduced ‘The Companies Act’ in September 2013 which includes a new provision on CSR. It stipulates that a company earning profits over a set amount must, in every financial year, allocate at least 2% of those profit towards CSR giving preference to the local area where the company operates. The act sets out 10 activities which may be included by companies in their CSR policy, the first of which is to support eradication of hunger and poverty. India is the first country in the world to mandate CSR under national law. A further aim is to strengthen partnerships with media houses as they are well versed in behaviour change communication. A strong advertisement campaign has already been initiated involving the leading film personality, Aamir Khan, in collaboration with UNICEF. 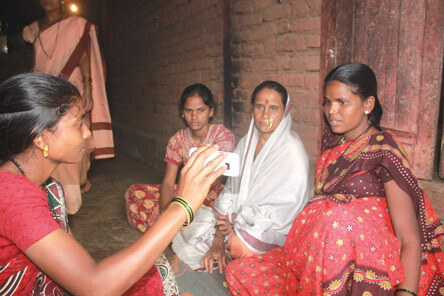 Videos around key behaviours are being dubbed in local languages and tribal dialects to reach out to a larger audience. Multi-stakeholder platforms have emerged even at the grass root level in Maharashtra in the last two to three years, as is evident from the initiatives in some districts where community participation has worked with great success. Elected representatives from Panchayats (local government assemblies) and donors have come together to contribute to the fight against malnutrition by donating food-grains and also by helping to strengthen the infrastructure at anganwadis (nutrition centres or nurseries) in the villages. There are many examples of these kinds of community ‘best practices’. There are a number of challenges of working in multistakeholder groups. There can be different views about preferred interventions. Ministers may prefer investments in infrastructure, while businesses may have different ideas. Standardised projects rarely work in practice and it is important to customise interventions for each organization. Delays in decision-making and in finalising Memoranda of Understanding (MOUs) can occur. Businesses may prefer to work without entering into MOUs or signing formal agreements. While this seems to be the faster and easier option, some firms prefer to sign MOUs before committing resources, however. There are often delays in finalising the paper work, and some firms lose interest and back out. There can be a lack of clear government policy guidelines on partnerships which lead to questions in relations to whether power to sign MOU’s rests with state or district level officials. District or sub-district officials may not be willing to take decisions or to enter into partnerships in the absence of clear guidelines, and many opportunities could be lost. RJMCHN is currently advocating for a clear government policy in this regard. Should they enter the nutrition arena even if it is not their ‘core competency’? Should they outsource CSR activities to NGOs, or should they become more closely involved in implementation? Should they invest large resources in an uncertain political climate? Should they work with government or independently? Should they start small pilot projects in selected villages, which rarely get scaled up? Should they concentrate on showing results in a small area through intensive and qualitative efforts, even though such efforts may not be scalable? There are challenges in designing projects which are viable and sustainable. Firms want to take up projects which can be continued through the regular government (or NGO) machinery even after the pilot project has ended. RJMCHN efforts are to ensure that interventions are designed in such a way that projects can become integrated into large scale government programmes. The Chief Minister of Maharashtra has declared that the state will provide therapeutic food as per international protocol which may be produced through small, local units. Despite the challenges, the Rajmata Jijau and its multi-stakeholder partners are contributing to improvements in nutritional status. A recent nutrition survey conducted by the Indian Institute of Technology in Mumbai in 2012 showed marked reductions in the levels of stunting, wasting and under-weight in children below two years of age over the last six to seven years. Bringing different stakeholders together results in more people talking about nutrition, and increases the visibility and importance of nutrition. The media plays a critical role in stimulating the public debate which can influence policy and decision-making. nutrition and include it in their political agenda than those in government. There are practical and ethical challenges to working with the private sector which have to be addressed.